From labor and supply sustainability issues to alchemy and presentation, trends in specialty coffee tend to be repeated in the world of gourmet chocolate, and vice versa. For some years now, one of those trends has been singularity of origin or varietal, a concept that has been readily adopted by coffee consumers and which is also entering the chocolate lexicon. So it makes sense that Kansas City (Mo.) high-end chocolatier Christopher Elbow Chocolates and Topeka, Kansas-based PT’s Coffee Roasting are partnering to bring to market a tightly packaged coffee bar tasting experience based on singularity — coffee origin and chocolate varietal. 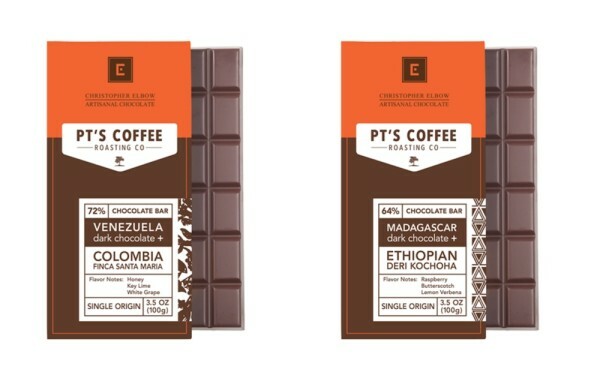 The companies have just announced the rollout of the three-bar line, with 3.5-ounce bars that are currently available at both companies’ retail stores for $8.50, and they say the bars will soon be distributed to specialty food shops and coffee shops throughout the United States. 64 percent Dark Madagascar Cacao blended with Ethiopian Deri Kochoha Coffee with flavor notes of raspberry, butterscotch and lemon verbena. 72 percent Venezuelan Cacao blended with Colombia Finca Santa Maria Coffee with flavor notes of honey, key lime and white grape. 46 percent Milk Chocolate from the Dominican Republic blended with Sumatra Karo Highlands Coffee with flavor notes of cola, tobacco and dark chocolate. Don’t forget your chocolate tasters flavor wheel! Seems there is a game as Brazilian specialties coffees are not mentioned and we have nice ones and various times winners of BSCA. Let play game and put all coffees against our coffess.